Successfully Added EL-Shirt - Sound Activated Light Shirt for Parties (Skeleton-XL) to your Shopping Cart. 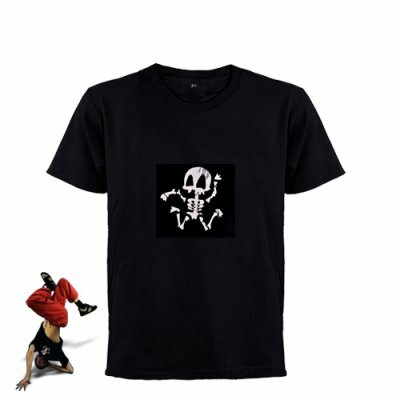 This sound activated electroluminescence shirt (EL-Shirt) features a white skeleton that lights up bone-by-bone as the music plays and is guaranteed to attract major attention at parties, clubs, raves or concerts. The battery pack can be turned off when not in use. The battery pack and display can be removed for washing. The battery pack is discreetly hidden in a secret pocket on the inside the shirt. I have bought the sceleton. Many my mates are surprised because THE SKELETON IS really special!